I first started blogging as a result of Amy's Bloggers' Quilt Festival, and am delighted that that time of year is here again. Twice a year, at http://amyscreativeside.com/, Amy hosts a quilt festival. No judging no categories, no postage costs or will-my-quilt-get-back-to-me worries, juts pages and pages of inspirational quilts and new blogs to look at. Some of my Blogging Buddies (Victoria and Teje to name two) were met over at Amy's, do go and have a look. 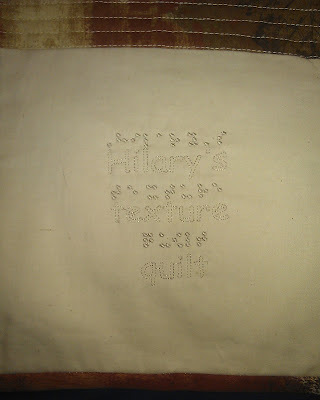 I stitched out just the word Texture in Braille, (three different versions: just filled, just outline and both) and got mum to check with Hilary which version was easiest to read. She had no idea that it was eventually coming back to her! What a sweet way to remember someone. I think it is a lovely quilt. 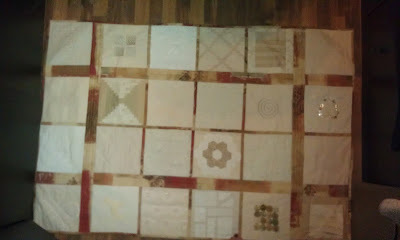 This is such a sweet idea - and a wonderful quilt. Thanks for sharing this one !! Dear Benta, this quilt is just amazing! It is beautiful and the idea to be able to feel different kind of textures is great! I'm sure Hilary was suprised and loves her quilt! Well done! What a testimony to your thoughtfulness. I went to your other post and looked at each block. What an amazing variety of textures you were able to create! Congrats...and thanks so much for sharing in the festival. I also started blogging as a result of Amy's BQF, she's got a lot to answer for!! I love this quilt and the whole concept of it, it would work for a whole variety of special needs, what a wonderful idea. I went back and looked at all the individual blocks! 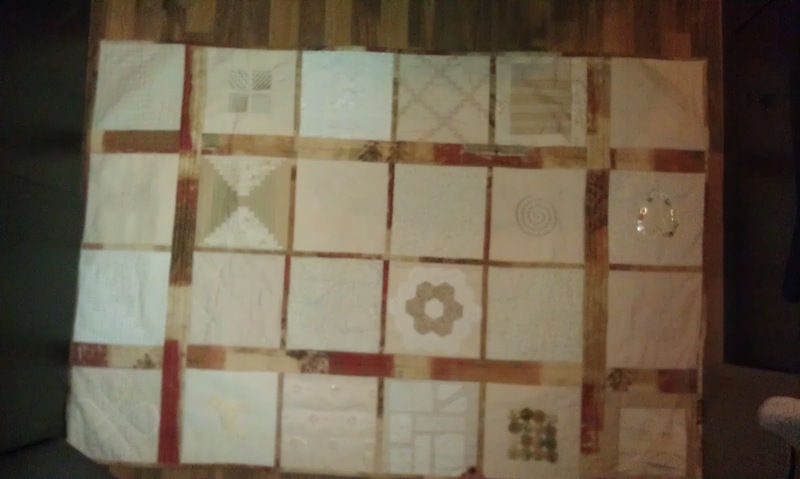 This is a wonderful quilt for someone who is blind or has failing or limited eyesight! Or even for someone who just enjoys the various textures you created! Great job! What a wonderful idea. And such a special gift. This is amazing and so very thoughtful of you. Beautiful job on this special quilt.